Dunnock are a band from San Francisco, California that has been featured before in this zine and plays a very raw, atmospheric and depressive form of black metal and this is a review of their self released 2013 promo. A very fast and raw black metal sound starts off the ep along with some blast beats and high pitched depressive screams and you can also hear a lo-fi atmosphere being present in their musical sound and after awhile synths are added into the music along with a mixture of slow, mid paced and fast parts. On the following track the music is all instrumental and starts out with some dark ambient style synths and after awhile spoken word samples find their way into the song and they avois any trace of heavy guitars or black metal elements. Dunnock bring in a very raw and atmospheric approach to depressive black metal on the first song and go for a more dark ambient direction on the following track to give this 2 song promo a decent amount of variety, the production has a very dark, raw and lo-fi sound while the lyrics cover dark and depressive themes. 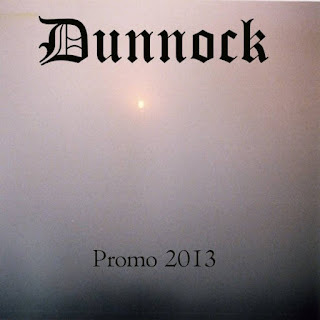 In my opinion this is another great sounding recording from Dunnock and if you are a fan of raw, depressive and atmospheric black metal, you should check out this promo. RECOMMENDED TRACK "Dwells in Mud". 8 out of 10.